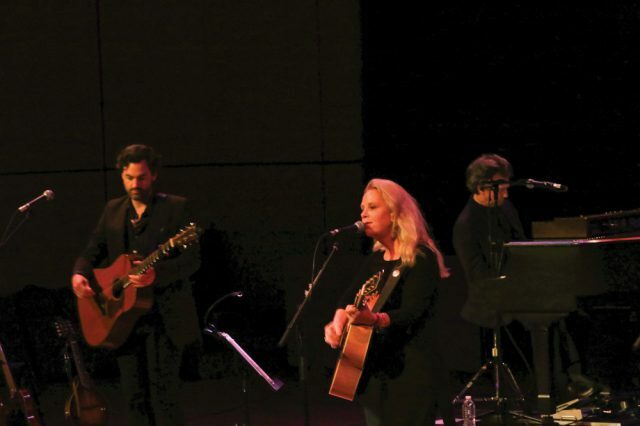 On the evening of Oct. 14, the Music Center hosted Mary Chapin Carpenter in a return performance for the most recent installment of the 2017-2018 Goshen College Performing Arts Series. Chapin Carpenter is a five-time Grammy Award-winning singer-songwriter and an inductee in the Nashville Songwriters Hall of Fame. Her back catalog consists of an expansive 14 albums, the latest being, “The Things That We Are Made of,” released in 2016. Chapin Carpenter previously performed at Goshen College in 2006. Chapin Carpenter’s bassist Don Dixon and Marty Jones opened the show. Performing before an audience of 863 people in Sauder Music Hall, Chapin Carpenter opened her set with a cover of “The Times They Are A-Changin’,” a song made famous by folk singer Bob Dylan. The entire concert featured dark, moody lighting. In addition to playing guitar herself, Chapin Carpenter was accompanied onstage by a band consisting of drums, bass played by Don Dixon, piano and an additional backing guitar. Before her second to last song, Chapin Carpenter let the audience ask four questions. One audience member asked about the meaning behind, “Luna’s Gone,” a track from her 2004 release, “Between Here and Gone.” The audience member asked if the song was about the loss of a friend or a pet. Chapin Carpenter replied that the song was about a beloved pet cat. “It was a great moment of connection between the audience and the performer,” said Maryn Munley, performance venue production manager for the Music Center. The 2017-2018 season of the Goshen College Performing Arts Series marks the 20th anniversary of the series. The ongoing season consists of 10 new and returning acts set to perform in Sauder Music Hall. Past installments of the 2017-2018 season have included the five-member ensemble, Canadian Brass. Future installments in the season include performances by Time for Three on Nov. 5 and The Knights on Nov. 14.